The aural aspect of animals pertains to their hearing; it can also refer to sound in general. If you belabor a point, you keep emphasizing an idea or fact repeatedly in a way that is annoying. If an activity is punctuated by something, it is interrupted or emphasized at intervals. Outside the glass booth, Herman could see the upset woman waving her free hand and gesticulating during her telephone conversation. She banged her palm against the wall of the booth and pointed aggressively into the air, gesticulating and emphasizing her displeasure with hand and arm motions. After hanging up, the woman tossed her hands over her head and gesticulated her feelings of frustration and helplessness without any words being said. Quiz: Try again! What does it mean when one gesticulates? One is under the influence of powerful, uncontrollable emotions. One observes someone in a hard situation without being able to do anything. One uses hand and arm movements while talking to express and emphasize a point. Articulate Gestures To gesticulate is just to be articulate in your gestures. When one gesticulates, one is using “little” motions or actions of the hands and arms, which is a way of “bearing or carrying” oneself as one speaks. 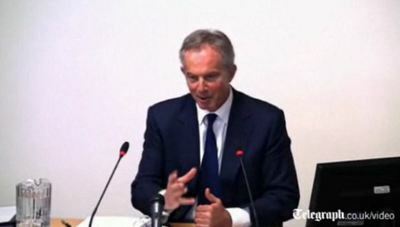 Telegraph UK Tony Blair gesticulating while talking.